After many years in World Square, Bamboo Massage is now located down the hill at 651 George Street. Come see your favourite masseuses in the newly renovated premises just across George Street from the Capitol Theatre. Now Relocated to 651 George Street. Address: 651 George Street Sydney 2000 NSW Click address for navigation. Directions: Look for the green bamboo decorated door - see photo below. Specialty: Large variety of styles and masseuses - Taiwan, Hong Kong, China, Japan, Thailand. Parking: Some metered parking in surrounding streets and in Chinatown. Public Transport: 5 minute walk to Central Station. Soon to be a light rail at the door!!! Premises: Newly renovated, modern & clean. Shower & bathroom facilities available. Beautiful girls and the best massage ever! Totally worth it. 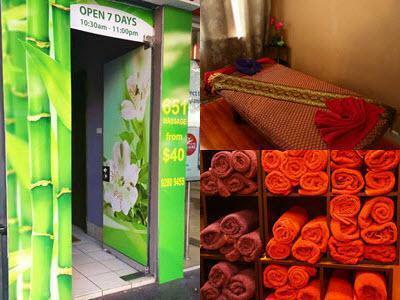 Looking for best in relaxation massage near World Square, Town Hall, Haymarket, Central Station? Call 0401 015 756 Now!